1. This one follows the Sweet Sunday Sketch Challenge #78 with Karen Giron over at the sweetest thing. The blossoms are from Flower Fancy, and work perfectly with Baroque Motif. The centers are full of Chocolate Fine Supernova Glitter and spritzed with Vanilla Shimmer. The petals are sponged with Pretty in Pink and Regal Rose. No watercoloring here! 2. Pretty in Pink scallops line the Chocolate Chip strip embossed using the bark pattern from the Texturz Plates Kit #4. 3. The Linen Thread is dyed using a Chocolate Chip Stampin’ Pad. For a sweet finish, thread the Hodgepodge Hardware, wrap the card, and tie a little whimsy bow! 1. The Vintage Wallpaper Embossing Folder left a beautiful raised image in the Pear Pizzazz cardstock. With one fourth a piece the matchbox die and a panel for the card is wallpapered. The envelope flap is also embossed to complete the ensemble. The matchbox could be filled with chocolates, jewelry, or some other special treat. 2. The Watercolor Trio Stamp Set from the Summer Mini was colored using Stampin’ Write Markers, then spritzed with water to create a watercolor garden. 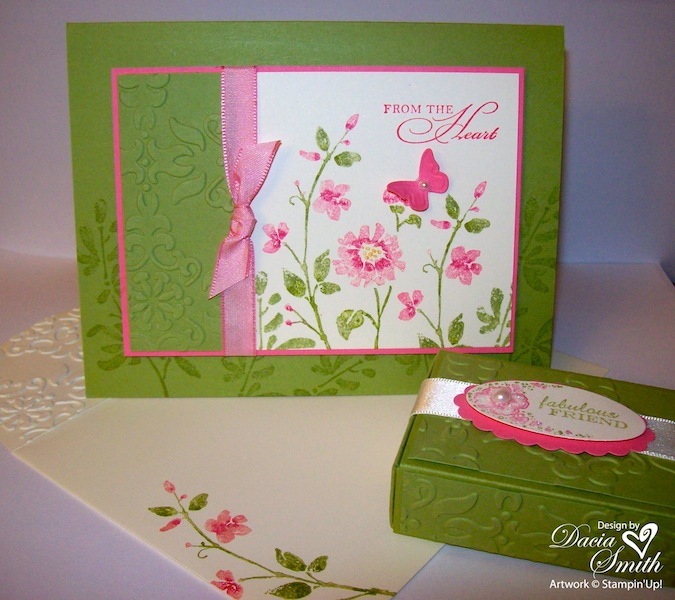 The stamped butterfly was switched for a three dimensional embossed one from the Beautiful Wings Embosslit Die. The finishing touch is a new Basic Pearl from the 2010-2011 Idea Book and Catalog. 3. 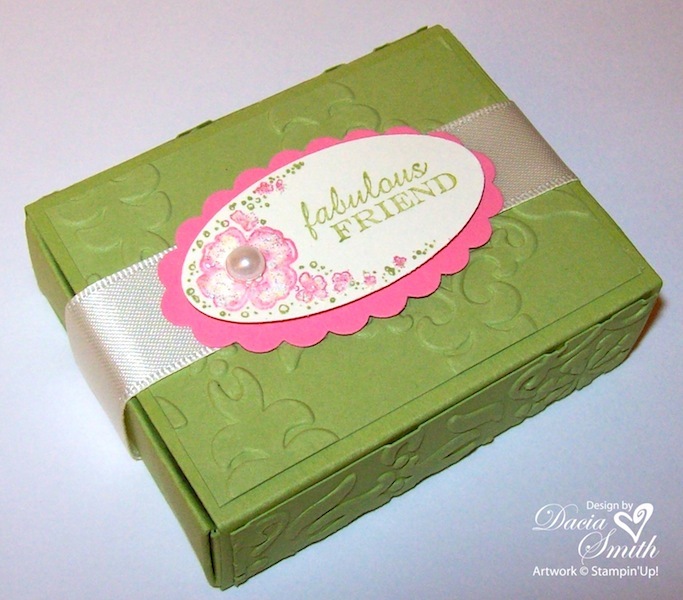 The matching box is wrapped in Very Vanilla Satin Ribbon and embellished with a stamped image from Oval All. A little Dazzling Diamonds was added to the blossoms to give it a little extra punch. 1. 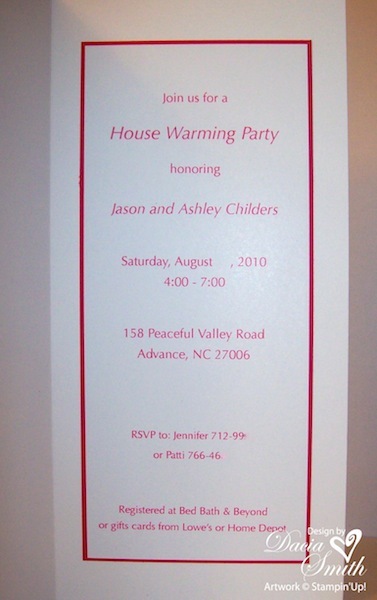 This invitation is for my special stamping friend, Ashley. She and Jason recently bought their first home, and are planning a House Warming Party. 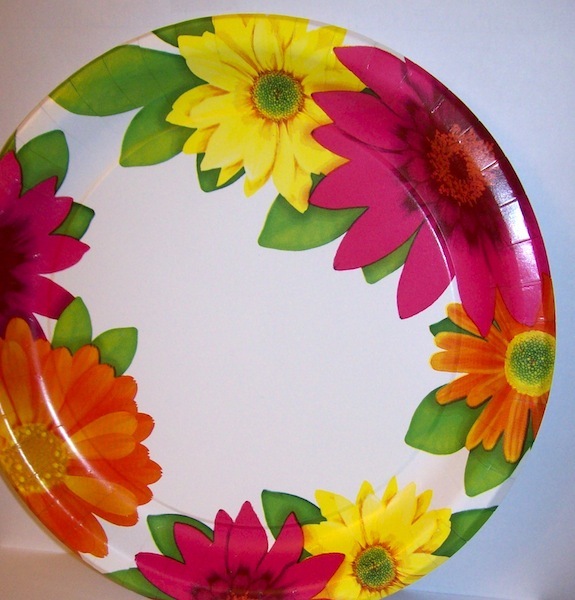 My inspiration came from the party plate. Do you like the idea? The new Color Collection is wonderful. They work so well together!My favorite new in color is Pear Pizzazz. 2. The smallest blossom is from the Punch Pack found in the Summer Mini, and the Square Lattice Folder helped to add the right texture to the centers punched with the Crop-A-Dile. 3. Want to see the inside? The inside panel is type set and printed using my computer. 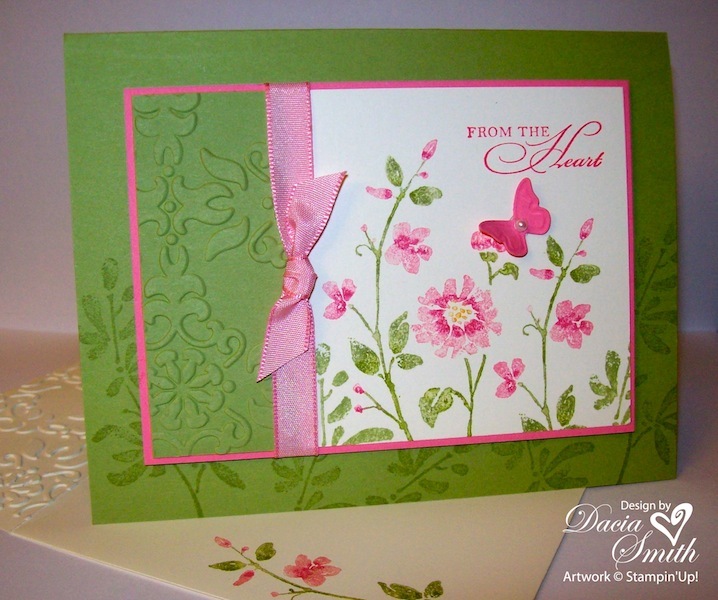 The color matches perfectly with the rgb formulas for each Stampin’ Up! color. 1. This great summer page is created following my July Template. My monthly Scrapbook Class is July 19 at 6:30 pm. 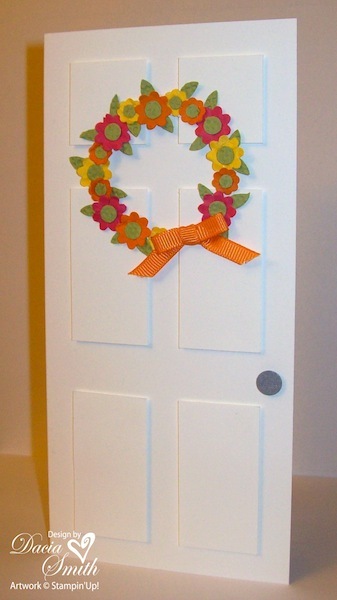 Your cost is $15.00 and includes the template, step by step instructions, and all the supplies to complete your page. You’ll need to bring 6-8 pictures of your favorite summer event. Hope you’ll consider joining in on the fun! Want to teach the same class to your stampers and friends? Get your copy of the template here! 2. The featured stamp set is Tropical Party. You can’t beat it for summer fun in the sun. The blossoms are stamped in Tempting Turquoise and Pacific Point. The Tangerine Tango centers create the pop. Use your Crop-A-Dile to get the perfect size circles for the centers. 3. The Distressing Tool is a fun way to roughen up the edges of your card stock and add a cool shabby chic look to any project. The Crumb Cake and matching Island Oasis Designer Paper feature this technique. The Tropical Party Stamp Set and matching Island Oasis Designer Paper are offered through the Summer Mini catalog and will be available until August 31.